Putting together some thoughts I've compiled over the past few months working with limbs and a pole saw, working with smaller limbs on down trees and even larger logs that are bucked without splitting; especially limiting the act of sticking saws at the most inopportune times. One of the most beneficial techniques I've seen in a long time is the simple slide notch. 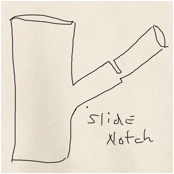 Now the slide notch is an Open Face Notch, placed shallow into the wood, that allows the hinge to work. Without a hinge of some sort, the fiber which grows in circles pushes outward and splits or pulls -- which often catches the bar and chain. I've found this to bind me more times than not. The newest of these notching techniques -- I have seen this slide notch work very well in pole saw applications. 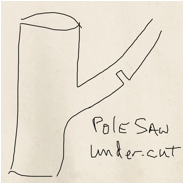 Most people when cutting a limb with a pole saw makes a vertical undercut on the limb. Cutting up into the lower side of the limb to make a kerf. Then the pole saw is placed on the top side of the limb and a downward cut is made to match the bottom cut from the top. It works... But think about what happens when the limb begins it's decent to the ground. That kerf of the lower cut then closes as the top cut is made. When the kerf closes, there are in some cases extreme pressures that have to go somewhere. Often this movement pinches and binds the saw chain and bar. Look at this drawing depicting the bottom kerf. If you can make it in to half of the diameter of the limb without starting to bind ** -- you will then be able to complete the task with a cut from the top. The slide notch however looks and feels different and is different, but it works as a notch should instead of a kerf cut that closes. The slide notch doesn't cause pressures and twists that can bind the chain and bar. It is incredibly capable of directing and controlling the movement of the limbs decent, with little or no splitting or pulling of fibers. The slide notch is produced simply by turning the bar and chain parallel to the lower side of the limb. Now slide the bar up or down the limb making an opening in the limb bark and fiber. Then as the cut is made from the top down, the hinge fiber is allowed to work as a hinge. The notch and hinge can even be made toward the side of the limb to direct the limb in a more sideways direction. In either position the slide notch works much better than the kerf cut. If you want the limb to "jump cut" so to speak it can still be accomplished by cutting the slide a little deeper into the limb. A little more angle into the fiber will accomplish this by leaving a springy tab of fiber that seems to controllably push the piece away better than the kerf closing harshly. To complete this, as the limb starts its decent, as the notch fiber begins to close - simply cut the hinge. As always with the kerf cut, you make it (the notch) first on the compression side of the limb or trunk. Then complete your cut from the tension side. Remember if you do not want any twist in the limb that will catch your saw bar, make sure you leave a straight hinge, parallel to the slide notch as it is when felling a tree.